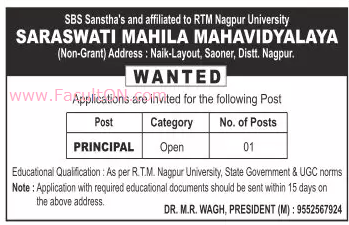 Saraswati Mahila Mahavidyalaya, Nagpur has advertised in LOKSATTA newspaper for recruitment of Principal job vacancies. Interested and eligible job aspirants are requested to apply within 15 days from 11th October 2018. Check out further more details below. About College: Saraswati Mahila Mahavidyalaya was started in 1988-89. Affiliated to M.D. University, Rohtak, the college is being run by a progressive society Saraswati Education Society (Regd.) which is committed to provide high quality education to the young girls of the area. It is running various other educational institutions also keeping in mind the educational requirements of the area. How to Apply: Interested and Eligible candidates may send their resume giving full details along with recent colour passport size photograph and copies of educational / experience certificates to THE PRESIDENT of the college address provided below by Post within 15 days.